Courage is the choice and willingness to confront uncertainty with the quality of your Spirit. 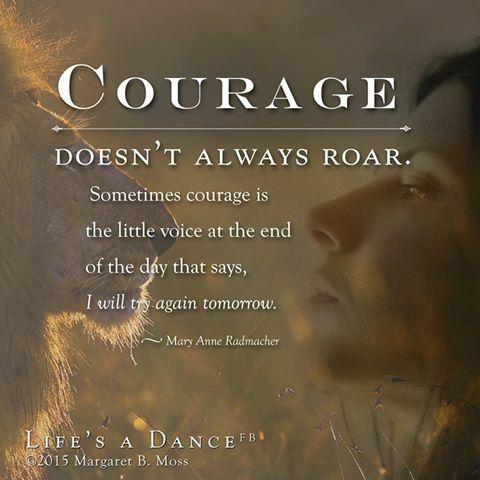 Courage takes confidence, something that not all of us have a lot of. There is no absence of bravery if a mother needs to protect her children. So why would that same mother have so much fear about protecting herself? Our time is limited here, don’t waste a single day of it living someone else’s life. Don’t get trapped into the beliefs of another persons dreams and wishes. Dig deep inside of you, and allow your own ambitions to rise to the surface. Turn a deaf ear to the noise of the World and listen only to the whispers of your own heart. When you decide to stand still long enough to listen to what your Soul is speaking to you, you will know that you have found courage. Find the courage to think differently. Living life by the dogma of our Ego will only keep us locked into what society expects of us. Removing ourselves from the traditional or rational judgement of our mind takes courage, but in order to move mountains a different set of tools must be used. Courage is being scared to death, but following your intuition anyway! !